So yesterday @mandahill posted a link to a Library Journal article that ruffled a few folders. “OMG,” said the archivists, collectively, “did he really just SAY that about us?” Oh yes. Yes he did. So these two librarians are chatting at the reference desk (next to a window! with sunshine!) and one of them is all, "Archives will always need librarians to curate and preserve." And the archivist below them in the basement is all, "Hey librarians, I can hear you down here." The whole thing would be kind of sad if it were true, but it's not, it's just a metaphor for how librarians and archivists need to communicate better. 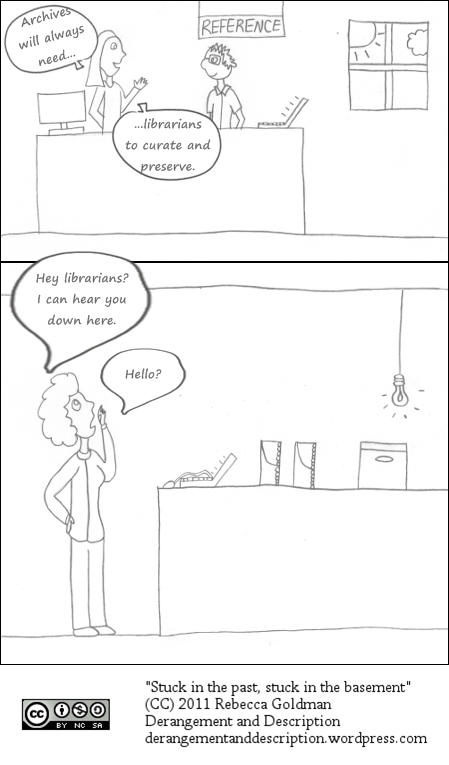 Hey Professor Stephens: a lot of the things you’d like to see librarians doing, archivists are already pretty good at. Helping users find things? Creating localized collections? Helping users create localized collections? I’ve done all those things. In the last week. And I think I’m hardly unique in this respect. We archivists would be happy to show you how it’s done–you just need to ask. Hey archivists: don’t wait for the librarians to come find you in the basement. We’ve got a lot to learn from each other, and the sunlight would do you some good. So, one of the many things keeping me from comicking these last couple of weeks (sorry kids) is this case study on DnD that I’ve been working on for a book for new LIS professionals. I’ve posted my current draft below, and will update it as I get suggestions and feedback. If you have questions you’d like answered, let me know! Feel free to leave comments here or email me. Editing will end sometime on Sunday. What is Derangement and Description? DnD is a webcomic blog about archives, metadata, and preservation. When I started the blog, I alternated between two types of comics: EAD comics, which are mock finding aids for famous people and organizations, and hand-drawn comics. I’ve since branched out into photocomics, song parodies, and even an animated video. Why did you start writing DnD? When I first started working in an archives, I looked around for a webcomic–the archives equivalent of Unshelved–but couldn’t find one. So I decided to start my own. I figured that since there wasn’t already another archives webcomic, it wouldn’t be hard to be the best! At the time that I started the comic, I was just beginning to learn EAD, and I had some ideas for using the tags literally or punningly to comic effect. The archives field is also blessed with a very large vocabulary of terms that have a very specific meaning to archivists (appraisal, processing, etc.) and I saw the potential for a lot of humor there. From the time I started the comic, I saw it as my professional contribution to the field. I didn’t yet have the education or experience to publish papers or present at conferences, and I thought EAD jokes and drawings of talking doc boxes would be an easier way to start. Where do you get your ideas for comics? I keep a running text file of comic ideas, and I write them in the margins of my notebooks, because I never know where I’ll be when an idea strikes! I draw inspiration from anywhere and everywhere. Many ideas come from work, either through colleagues or through my own experience. Others come from archivists on Twitter and professional listservs. Sometimes the ideas happen in reverse—I’ll think of a pop culture reference, or an Internet meme, and try to find the connection to archives. How has DnD benefited your personal/professional development? I sometimes find it hard to meet new people at conferences, so it’s great when archivists recognize me from the comic and approach me first. Through the blog and its associated Twitter account, I’ve been able to arrange site visits and network with other archivists across the country. I used to worry that doing a humor blog would make it difficult to be taken seriously as an archivist, and fortunately, that hasn’t been the case at all. However, the line between my professional identity and my blog identity is occasionally blurred—I’ve gotten emails at work addressed to Dee Dee, my webcomic alter ego. I also think of the process of researching my comics as part of my professional development. All those EAD comics have certainly improved my encoding skills, and I also check the content of my comics against resources like the SAA Glossary. Because I know my comics are being used in lectures and educational presentation, I try to make them as accurate as possible. Do you have any tips for other new professionals? There are an awful lot of library and archives blogs out there. If you’re thinking of starting one, ask yourself: how will yours stand out? Do you have something to say that no one else is saying? Are you saying it with talking doc boxes? (Sorry, I may have that market cornered.) The library-archives blogosphere may seem crowded, but I think there’s still room for newcomers with original ideas. If you’re considering doing a humor blog, run your ideas by colleagues inside and outside your field. When I first started doing comics, I shared my scripts with a mathematician friend. If he thought my jokes were funny, even being unfamiliar with the archives references, then they were funny enough to draw for the archivists. I also find brainstorming with fellow archivists helpful when I have a funny idea that needs some work to become a comic script. Finally, don’t wait until your content is perfect to start blogging. I was so self-conscious about my comics that I didn’t even put my name on the blog until after it won an award. As with More Product, Less Process, tell yourself you can always go back and fix things later—and then don’t. Learn from your mistakes, and implement your improvements starting with your next entry. It can take time to find your own style, but you won’t find it if you never publish anything.